Regarded by many as one of the most talented German artists of his generation, Martin Kippenberger (1953-1997) established a practice that included many mediums, performance, and artist collaborations. 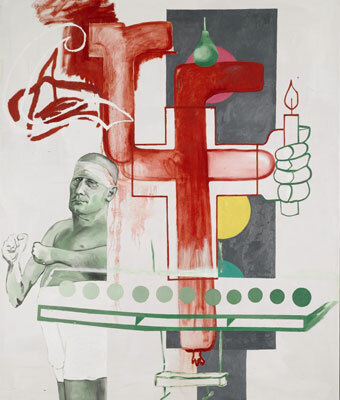 Kippenberger was the center of an important group of postconceptual enfants terribles in Germany that included artists Albert Oehlen, Markus Oehlen, Georg Herold, Werner Büttner, and Günther Förg. In his work, Kippenberger sought to disrupt art’s complacency with a satirist’s wit that directs the viewer to uncomfortable realities of the present world. Dissuaded of art’s power to reveal truth or the possibility of producing original work, he nonetheless produced important new work with a strong political and social content, revealing, as John Lane observed, “a moralist in despair.” The exhibition features a selection of paintings from the last decade of the artist’s life and 17 “Hotel Drawings,” intimate works created on hotel stationery gathered on his peripatetic travels from 1987 until 1997. The works present an irreverent and ferocious humor that accentuates the late artist’s acute sense of moral responsibility to humanity and the history of art. Organized by the Portland Art Museum, this exhibition is part of an ongoing series of contemporary art exhibitions organized by Bruce Guenther, curator of modern and contemporary art. Supported in part by the Miller Meigs Endowment for the Contemporary Arts and The Paul G. Allen Family Foundation.